Earlier this week I was lucky enough to find a cicada nymph at a local park in Middletown, New Jersey. I took the cicada home, took some photos and then released it the next day. The cicada turned out to be a female Tibicen tibicen tibicen (formerly T. chloromera) aka a Swamp Cicada. The trees near where I work are chocked full of Tibicen tibicen cicadas (formerly known as T. chloromera, also known as Swamp cicadas). Then its name changed to Tibicen chloromerus, so the gender of the Genus and species name would be in agreement (or so I believe). 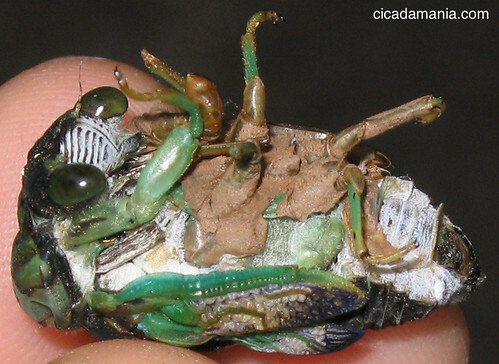 Now, this cicada is simply Tibicen tibicen. To read more about why, you’ll need to read Entomological News, Volume 119 Issue 3, “The Identity Of Cicada tibicen Linné [=Tibicen chloromerus (Walker, 1850)] (Hemiptera: Cicadoidea: Cicadidae) no access”. A lectotype is designated for Cicada tibicen Linné, 1758. The Linnaean specimen located in the Zoological Museum of Uppsala University can be traced to Linné and the original species description. The species is determined to be the same as what is currently recognized as Tibicen chloromerus (Walker, 1850), making T. chloromerus and Cicada sayi Smith and Grossbeck, 1907, junior synonyms of Tibicen tibicen (L.). 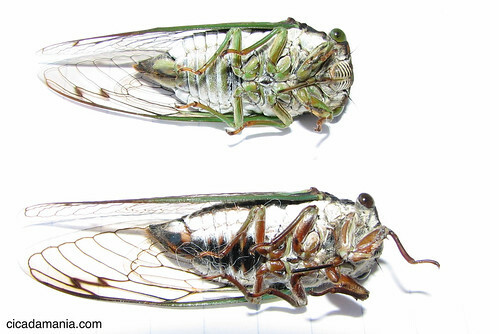 Of course you can call it Swamp Cicada, Morning Cicada, or Green Annual Cicada (from Bug Guide). It doesn’t care. Now do I update all instances of “Tibicen chloromera” on this site, or not. Hmmm…. The Tibicen is the genus of annual cicada most people are familiar with. They emerge every summer. They do not emerge in broods. They emerge in small numbers (small relative to periodical cicadas). They are timid and elusive compared to periodical cicadas. 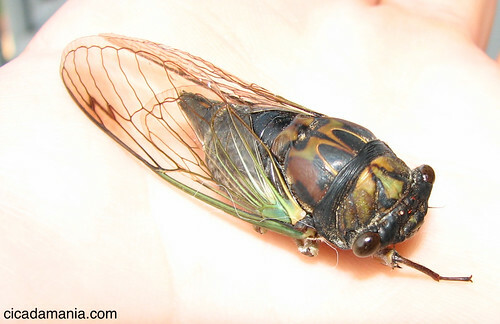 Most are physically larger than periodical cicadas. They are well camouflaged: their colors and patterns of colors help to hide them in their surroundings. They look like little military vehicles, IMHO. Cicada researcher Kathy Hill’s photo of 18 different Tibicen species. Tibicen anatomy page (offsite link). My Tibicen photos, including Marvin, the CicadaMania mascot. All Tibicen posts on this website. 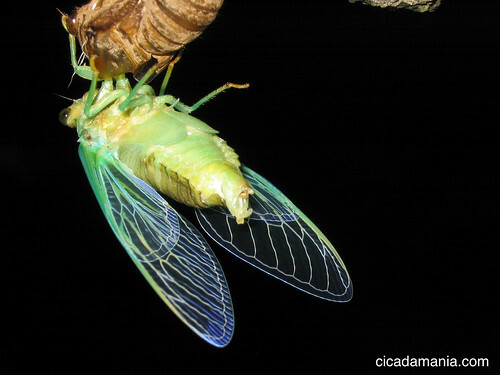 Watch these videos of Tibicen tibicen tibicen cicadas, aka a Swamp Cicada, formerly Tibicen chloromera. Tibicen tibicen video by Dan. Tibicen tibicen – Tibicen chloromera. Marsha M. sent us this photo of a Tibicen tibicen (T. chloromerus, T. chloromera) from New Jersey! Read more about it on her blog.